Pick up at the hotel , riad, airport or wherever you want. Half-board accommodation in hotels / riads. (Dinner + room + breakfast). Tour guide throughout the route that speaks Spanish. Camel ride to the camp. 1 Night in tent amid the dunes with dinner and breakfast. Tips and what's not in the program. Departure from Marrakech, in the morning, direction Gargantas de Dades. On the way we will cross the High Atlas Mountains, crossing the Tizi n'Tichka pass, opening our way among numerous Berber nomadic peoples that inhabit the area. We will continue via Ouarzazate crossing the valley of Roses, to enter the gorges of Dades, where the so-called "route of the thousand kasbahs" begins. Accommodation in Dades Valley and dinner at the hotel. Breakfast at the hotel. We head to the Gorges of Todra, where you can take a pleasant walk between its imposing canyon of walls of more than 200 meters of altitude, until the exit towards the desert through the palm grove of Tafilalet. Arrival at the hotel at the foot of the dunes, where you can walk through the fine sand of Erg Chebbi, relax and enjoy this impressive landscape. 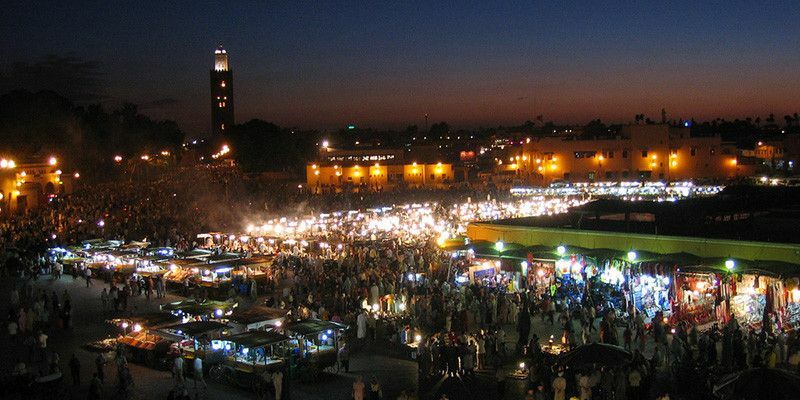 At night, you will taste a delicious Moroccan dish. Accommodation in a room at the hotel. After a hearty Moroccan breakfast, we will board the 4x4 to begin our tour around the dunes. Erg Chebbi, desert region populated by sand: Among the numerous stops that await us, we will discover how and where the nomadic families of the area live, wild oasis in half of nowhere, spectacular landscapes and small desert towns, palm groves ... Inevitable stop on our way through the town of Khamelia, people from Mali, who will make us enjoy a nice concert of gnawa music, while we savor a delicious tea . On the way back to the hotel, our dromedaries await us to depart on a route of an hour and a half, breaking through dunes, until we reach the heart of the desert to contemplate the beautiful sunset. Sheltered by the Great Dune, and enjoying the music of the drums, dinner and Moroccan tea, you can contemplate the immense sky of stars and sleep in nomadic tents. After picking up at the hotel or riad where you are staying first thing in the morning, we will head north until we reach the Rif area, where Chauen is, our destination. Once in Chauen (also known as Xaouen or Chefchauen) you will have 5 hours of free time to tour the city at your leisure. Inside the medina you can not miss the Uta el-Hammam square (the heart of the city and the ideal place to eat), the Great Mosque (with a curious octagonal tower) and the Kasbah (containing a garden, a museum and a art Gallery). Leaving the medina, the most famous point is the Ras El-Maa waterfall, where the sound of the water and the green hills provide a great dose of fresh air. If you keep walking, you will get a beautiful view of the city. We will be back in Fez around 7:00 p.m. The tour will end in your accommodation or wherever you want.